Posted on February 8, 2016 by Siddharth. The Telecom Regulatory Authority of India (TRAI) has come out with a set of regulations explicitly prohibiting differential pricing for data services in India. 3. Prohibition of discriminatory tariffs.— (1) No service provider shall offer or charge discriminatory tariffs for data services on the basis of content. 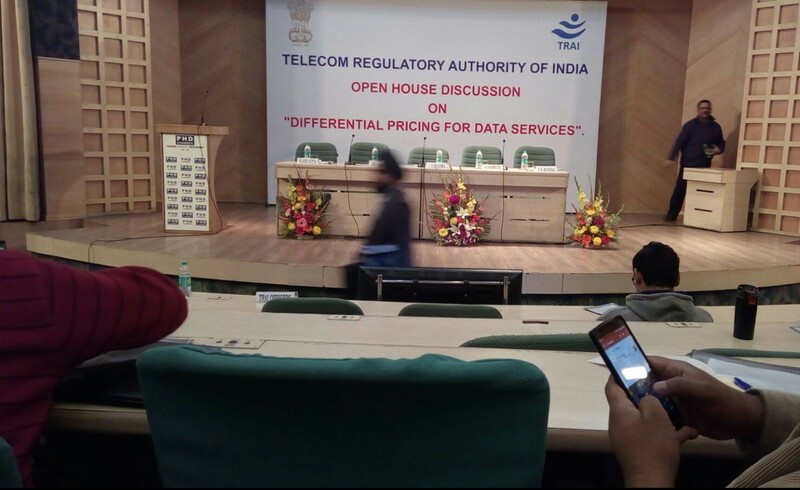 TRAI recently concluded a public consultation process regarding differential pricing in data services (resources). The consultation paper covered all differently-priced or zero-rated services offered through data. The process has witnessed tremendous public participation, with a spirited campaign by Internet activists (Savetheinternet.in) and a counter-campaign by Facebook where it garnered support through users by using the narrative of connecting those who have no access (https://www.facebook.com/savefreebasics). CCG submitted a formal response as part of this process, which you can read here, and filed an additional counter-comment signed by ten different civil society and research organizations. The consultation process also involved a public discussion on the questions raised, where the usual suspects were all present – telecom companies arguing for differential pricing, and internet activists against. Also present were startup- and user- representatives. Facebook’s telecom partner for carrying the Free Basics platform in India —Reliance Communications — was then instructed by TRAI to put a hold on rolling out Free Basics until they came up with a clear position on differential pricing and net neutrality. The regulator later confirmed that they received a compliance report to this effect as well. Facebook had been aggressively pursuing its campaign to collect support in favour of its platform for the entire duration of the public consultation. TRAI has clarified that these regulations ‘may’ be reviewed after a two year period, or at an earlier time as decided by the Authority. An exception to the prohibition has also been included, to account for emergency services and services offered during ‘times of grave public emergency’. An additional exception is that of closed networks which charge a special tariff for their usage. Posted in Broadcasting, Governance, and Regulation. Tagged content regulation, differential pricing, Facebook, free speech, freebasics, internet.org, net neutrality, reliance, and Trai. Don't you think the exception that you've mentioned in the last line is quite contentious? I'm just looking for an opinion on this. The proviso grants an exception to "data services over closed electronic communication networks". Such a network has been defined as "a communications network where data is neither received nor transmitted over the internet". So, a specialised 'managed service' like a Content Delivery Network accessible only to users on a particular network used to deliver content that is not connected to the internet for which the service provider may charge a lesser tariff than it usually would could escape the prohibition under these Regulations. Unless of course the service provider is doing this "for the purpose of evading the prohibition in this regulation". This seems so open-ended, subjective and extremely discretionary. From the way I see it, any service provider could provide data (or content) on a closed network not connected to the internet and provide discriminatory tariffs to the exclusion of others not on their network and get away with it until somebody takes note of it and goes into a determination of whether this is being to evade the prohibition in this regulation. And we all know once this goes into litigation, it could take ages to have a final decision on this.